Second Generation one hundred fifty MHz Technology – moisture and hectolitre Weight/Test Weight in ten seconds.The AM 5200 is Perten’s second-generation high frequency moisture meter. Drawing on the expertise from over 1,000 installed units, we’ve designed a moisture meter improved in each and every facet – accuracy, repeatability, dependability, and user interface. It may be a stand-alone moisture meter to be used at terminals or may be integrated into machine-controlled testing systemsHigher frequencies give more penetration of samples; the updated UGMA provides a more correct result despite temperature or crop type; the improved mechanism provides higher repeatability. together this makes the AM 5200 the most correct and repeatable moisture meter on the market. It will analyze grains, oilseeds, pulses, beans, lentils, seeds and more for moisture, check Weight/Hectoliter Weight, and temperature. A moisture meter must be simple to use, and what could be less complicated than just choosing the merchandise to be analyzed and then gushing the sample into the instrument?At Perten Instruments we’ve continually taken pride in developing analyzers that are really easy to use that they’ll be used with confidence by non-technical personnel. The Aquamatic 5200 follows the tradition and might be employed by anyone after just a 1-minute introduction. 3 straightforward steps is all it takes: 1. Select grain type on the touch screen 2. Pour the sample. The analysis can begin mechanically. 3. After 10 seconds the results are displayed on the screen, and you’ll be able to empty the sample box. The Aquamatic 5200, like all Perten models, was designed to be simple to use. As seasonal employees are typically used at grain receivals, it is vital that the instrumentation they use is as straightforward to control as attainable. This decreases introduction and coaching time, and minimizes handling errors. For a right away receipt of results, the Aquamatic 5200 may be equipped with an optional ticket printer. The Aquamatic 5200 may be connected to a laptop for straightforward transfer of analytical results into business systems or workplace applications. you’ll either collect analytical results in real-time into a LIMS, or transfer results from the internal memory to a USB memory stick at your convenience. Quality, responsibleness, wonderful Support for a tremendous worth. It all comes together in the best package from Perten Instruments. It’s all concerning quality. The AM 5200-A is formed of heavy metal sheeting and Delrin. The build quality extends instrument life and reduces injury potential throughout relocation and shipping. It weighs forty five lbs.for a reason. The single piece cast cell ensures correct measurements of volume/density through precise management of cell dimensions. The RF electronics are designed directly into the cell center divide eliminating cabling and removes impedance matching problems over time because of connector degradation. A continuous strip of copper (6.8in2) makes contact with many kernels for an exact sample temperature measure over a large temperature range. the massive area/low mass means that fast response times when there’s an oversized disparity between room temperature and grain temperature, right down to -40F. It means that higher accuracy and shorter analysis times. A single, top quality motor is employed within the AM 5200-A. The simplicity of style results in a extended instrument life and less down-time. Our greater than seven year expertise has resulted in an optimized analysis procedure during this second generation instrument. choose the merchandise once, and also the instrument mechanically begins analysis on every occasion a sample is poured into the hopper. Not only will it speed up the analysis, it saves wear on the touchscreen. The door employs a self-cleaning firm “snap action” shut and is gravity driven. The “snap action” is meant to shake loose any build-up of material on the lower door. you’ll be assured the cell volume won’t change because of dirt build-up leading to inaccurate weight and volume measurements. The sample strike-off is crucial to controlling flow of product through the instrument. Our style minimizes rubble build-up within the instrument. Grain isn’t sprayed throughout the inside. The AM 5200-A uses three brushes to direct grain to the gathering drawer. The AM 5200-A has configurable information output using USB or RS-232 connections. Our Plug and play functionality mimics GAC© systems output for immediate replacement into existing scale package, LIMS, etc. an optional printer is offered. The Aquamatic 5200 is simple to use, however do not let its apparent simplicity deceive you. it’s the foremost advanced grain moisture meter on the market, and utilizes advanced technology to produce fast and correct results. How will a moisture meter work? Just about all bench top moisture meters use what’s typically cited as the capacitive technique or RF dielectric technique. With this technique a radio wave at a fixed frequency is sent through the sample. As water interacts with radio waves (that’s how your microwave works) it’s possible to work out the moisture content by measuring what proportion the radio wave is modified by the sample.The result that the sample has on the radio wave is termed the dielectric constant, and it will increase proportionately to the moisture content. There are variety of alternative factors that have an impact on the dielectric constant, maybe most notably sample density and temperature. These 2 factors are measured and corrected for in advanced moisture meters. Up till a couple of years ago moisture meters have used a radio wave with a frequency between 1-15 MHz. this can be a region that is simple to figure with as moisture contains a strong signal there and electronic components are accessible off the shelf for a long time. the problem is that there’s lots of noise, that the signal to noise quantitative relation for moisture is poor, decreasing the accuracy of the moisture measure and making the necessity for frequent calibration updates, and for specific calibrations for the various categories among a grain.For example, older moisture meters typically need to use many calibrations for wheat and barley, one per category. Another drawback of older technology was the “rebound effect”, where the instrument would scan too low when analyzing grain straight from the field. the rationale was the lower radio frequencies wouldn’t penetrate the kernels, so the instrument would solely see the surface moisture content.In the Agriculture study quite some effort was spent on finding the optimum frequency. Measurements were done from one MHz to over two hundred MHz, and the results very clearly showed that the accuracy was far better at one hundred fifty MHz than the previous 1-15 MHz range. At one hundred fifty MHz the noise is far lower and also the signal is far more specific to water. the result is that the shortcomings of the previous technologies are eliminated during a one hundred fifty MHz system. The sensitivity to kernel water distribution, grain variety, crop year and geographic location is far lower, and also the performance can thus be considerably higher. Another vital Agriculture development was the new UMA (Unified moisture Algorithm) calibration technique. It further improves the accuracy and makes it viable to use one and the same calibration for all grains and oilseeds. There are 3 main parts within the UMA – a replacement style of sample density correction, the utilization of a fourth order polynomial equation, and a replacement way to modify for sample temperature effects.A density correction is completed in most advanced grain moisture meters. As written above, density has an effect on the dielectric constant and so as to attain good accuracy it’s necessary to work out the density and modify for it when calculating the moisture content. What’s new within the UMA is that the equation by which the density correction is calculated. The new density correction equation creates an almost perfect correlation between the dielectric constant of a sample and its water content. it’s additionally a very important issue behind the power of the UMA to use one standardization for all grain varieties. The fourth order polynomial equation, which is the actual calibration, is a more advanced mathematical technique than what’s employed in previous moisture meters. this can be possible because of the higher processor power of the Aquamatic, that uses modern computing technology.The effects of sample temperature has always been an issue for moisture meters, however with the introduction of UMA this can be not a problem. The UMA uses a new rule for moisture correction that adapts the adjustment to the water content of the sample. the correct adjustment for a cold wet sample isn’t constant as for a cold dry sample, and the UMA handles that with excellent results. Superior Accuracy: Superior accuracy and repeatability are obtained using one hundred fifty megahertz measuring cell product of strong, high precision aluminum made of. The new cell is slightly larger providing a a lot of representative sample. 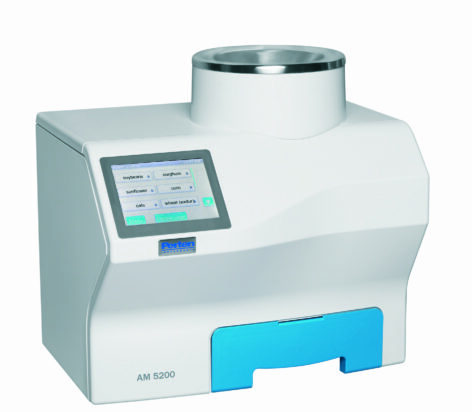 Rapid Analysis: simply pour the sample and also the AM 5200 begins analysis mechanically. Results are displayed in less than ten seconds. an optional flow-through provides for machine-controlled testing when the sample can be discarded. Modern Technology: using higher frequency, advanced computational power, USB information transfer, and the updated UGMA, the AM 5200 is meant for today’s grain trade. Correct Results on recent Field Samples: Older moisture meters scan up to 1 / 4 low in moisture once analyzing grain straight from the field (known as the rebound effect). the upper frequency measure utilized by the AM 5200 penetrates deeper into the grain providing a lot of correct results and shorter return of investment. Easy To Use: the massive color touch screen with intuitive program makes the AM 5200 straightforward to use. Input sample IDs, read results on a remote screen, and update through USB memory sticks all boost its flexibility and simple use. The touchscreen uses resistance technology and can even answer gauntleted hands.